The regatta was amazing and my role was incredible. 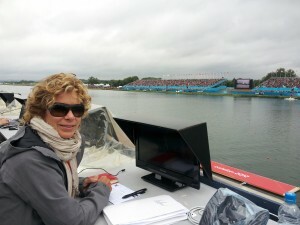 I did the live-call of the races at the 2004 Athens Games (like Barney Williams did so energetically here) but strange as it might sound – when you’re calling a race – you don’t really get to watch the rowing; this year my role let me really watch. I sat with other analysts and friends who are rowing legends in their home Australia, Great Britain, France and Romania. We remarked on all the great crews, the racing conditions and of course – the trouble we all got into back in the good old days! Every day I watched incredible things happen. The Canadian team had come with what I thought was 2-5 medal opportunities. The women’s eight, men’s pair and men’s eight were my best picks and I felt from their 4th place racing in Lucerne our men’s lightweight double might be able to move up one spot. Canada’s lightweight women’s double had been through so many changes in the last two years, who was in the boat, where they trained, who they trained with – I had been very afraid for over a year that while they felt that some battles had been won, they would lose the war. I remained optimistic for them but neither of the light doubles were able to step up and at the Olympics – failing to move forward is as good as taking steps back. The silver medal from our women’s eight crew was exciting to watch. They weren’t able to beat the Americans but their effort certainly made the Yanks uncomfortable. The silver from our men’s eight was a highlight race for many longtime rowing pundits. The road that the Canadian men took through the regatta was anything but smooth. They raced terribly in the heat, which forced this crew of giant men to question their pinpoint focus on gold. Sent off to race their repechage in some confusion – they turned to each other recognizing that they’d trained way to hard to lose focus now. Quickly they came to the consensus that they could race their own race – not in the image or shadow of the Gold medal crew of 2008. In their own stride they won their medal in what was one of the tightest 6 crew battles people had seen for decades. • The 30,000 person crowd – the Dorney Roar – was incredible. Pushing all rowers but without question driving the British rowers on. • The men’s light four was an incredible finish – with Gold Silver and Bronze all within a whisker and 4th just knocking at the door. • The men’s lightweight double. GB was leading with about 400m to go. The Danes attacked and GB -with the crowd behind -them responded. This happened about 4 times – the Danes attacked, the crowd roared, GB responded. Unfortunately for the home side – the Danes outlasted the Brits and with a glance as they passed, the home boys couldn’t match the last push. It was such an incredible battle. • Noteable – but not really a highlight – the weather was pretty iffy to start. Questionable cross winds, rain, lightning and thunder, sun, cold, heat… everything within a 2hr period. Weather is always a factor for outdoor sport – but not for media coverage! The journalist stands were all completely weather exposed. Points to CTV’s sound tech, Pernell, – aka MacGyver for creating a weather proof tent. In the end though – I chose a more exposed seat with a better view. This entry was posted in Marnie's Adventures and tagged London 2012 by Marnie. Bookmark the permalink.